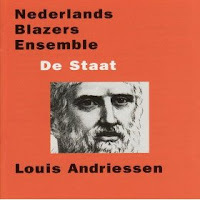 "De Staat" performance of Nederlands Blazers Ensemble (Nederlands Wind Ensemble) conducted by Lucas Vis is on CD published in 2008 by the ensemble's own label NBElive. CD review by Liam Cagney is available here. The same crew will perform "De Staat" on August 28 in Royal Albert Hall, London.